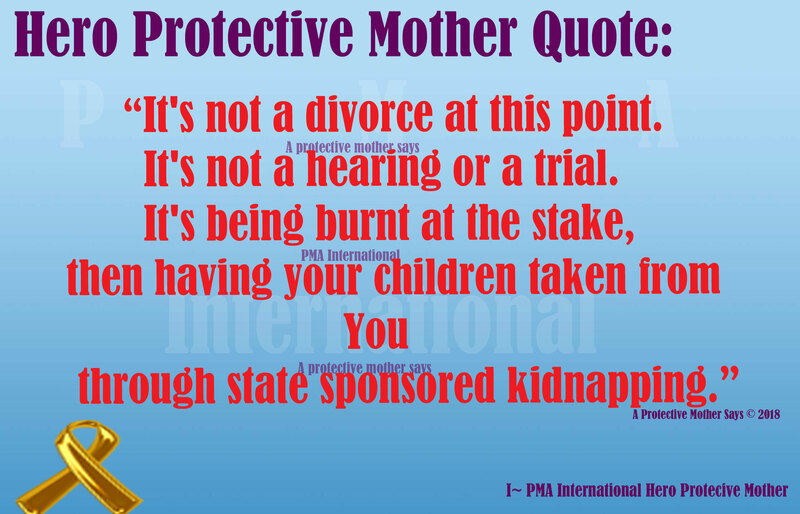 To all Hero Protective Mothers and their precious children- you have our respect, understanding, love and support. As the Holiday season is upon us, many Hero Protective Mothers will be without their precious children. This is a very difficult time of year. For some Hero Protective Moms, they will have no contact at all with their child(ren). Some moms will drop off presents not knowing if they will be received. Other moms won’t even know what to buy for their beloved child (ren) as they have had so little or no contact that the mom doesn’t even know what presents their own child would like. What music is their child into? What size does their child now wear? What are their favorite colors, books, or toys? All the beautiful loving traditions once shared cannot be shared anymore; sitting on Santa’s lap, decorating the tree, making x mas cookies for Santa or having that special Hanukkah dinner filled with tradition and symbolism. What we are feeling, the loss and pain, few can understand . Unless you have been in our shoes- a Hero Protective Mother, you cannot begin to know the depth of the heartache and raw pain that reaches right down to our very souls. We are their mothers. We grew these babies within us. This fact alone bonds us with them, and they with us like no other bond . We are bonded together beyond time, space, judges, laws, and certainly beyond family court. The mother-child bond is the strongest there is. Although many may try , it cannot be broken as it is God- given. Hero Protective Mothers as you go through the Holidays without you precious babies, with empty arms and hurting hearts , this is what we want you to hold onto. No matter how it looks now, you are bonded to your child. Your heart is their heart. Your souls connect. You are an essential part of each other that cannot be denied.This is a fact. Because of this fact, you cannot be separated forever. Only evil would try to break this God- given unbreakable bond. We believe we can overcome this evil. WE will overcome this evil through our unconditional love for our children-the strongest love ever to exist, and one day we will celebrate the holidays as a family once again. Take care of yourselves Hero Moms,through this difficult time, for one day- we are certain- our child(ren) will understand all our sacrifices, pain and hurt. We believe one day, our children will learn the truth and return home, to our loving arms, where they belong. Our children will return home to our loving arms, and history will reveal us for the Hero Protective Mothers we truly are. Until then , know you and your precious children have PMA International’s love , support and understanding, always.